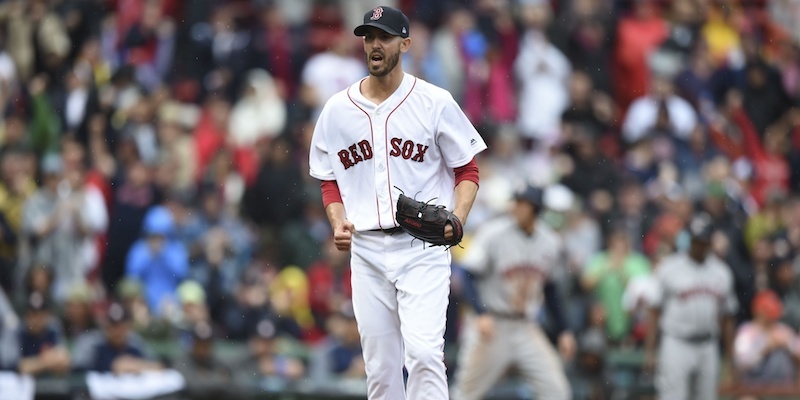 Rick Porcello is a fascinating part of the Red Sox rotation. Him performing well turns the group from one that is merely good to one that is potentially great. Chris Sale and a healthy David Price provide a really strong front two, but after that it gets murkier. Rick Porcello, Drew Pomeranz, Eduardo Rodriguez and Steven Wright (maybe) are all difficult to project. Having at least one of those guys throw 200-plus innings with an ERA that starts with a three will give the team something special. I would welcome all four of those guys doing so, but that is greedy and pushes the Red Sox into a six-man rotation. After Porcello dropped a 3.15 ERA, 223 innings, 5.8 WARP, Cy-Young-winning season in 2016, it seemed like he had finally harnessed his potential, and would be a guy who could provide a strong bridge to the back of the rotation. Turns out we jumped the gun on that. Porcello followed up his Cy Young season with a replacement level 2017 – by BP’s WARP anyway; FanGraphs’ version of WAR saw him as average. But regardless of the measure, 2016 stands out pretty clearly as the oddity in Porcello’s career to date. It is great that he showed that level of pitching, but it is unlikely he recreates the heights of 2016. Ideally, he can find a comfortable place somewhere between his 2016 and 2017 seasons in 2018. There is not a lot to choose from here. I think the best thing that can be said about last season for Porcello is that he took the ball every fifth day. He made 33 starts, racking up 203.1 innings, which put him over the 200 inning threshold for the third time in the last four seasons. While Porcello was not lights out in his innings, consistently eating innings does provide value. It keeps the team from asking Henry Owens to take a break from walking minor league batters to instead come and walk some major league batters. It is better to have Porcello out there. The gap between Porcello and a go-between minor leaguer might be shrinking, but Porcello remains the better option. Throwing 200 innings is great, but if the last bunch happen while overly fatigued, it could portend bad things (i.e., injury) for the following season. As far as I can tell this was not the case for Porcello. 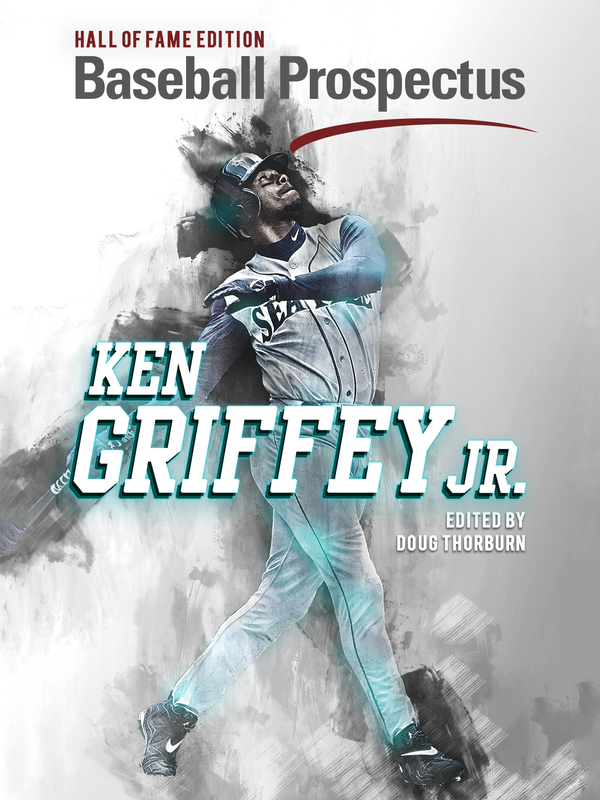 The velocity on all of his pitches held through the end of the season, and he was striking batters out at the same rate in the second half (22.0 percent) as he did in the first (22.8 percent). Porcello’s ongoing standing as a durable starter did not take a hit in 2017, but it would be nice if was more than just that. Porcello struck out a lot of batters in 2017, but when he didn’t miss bats he got hit hard. Oh boy, the hard contact. He is on the wrong end of many categories on the 2017 Statcast leaderboard (minimum 190 batted ball events). 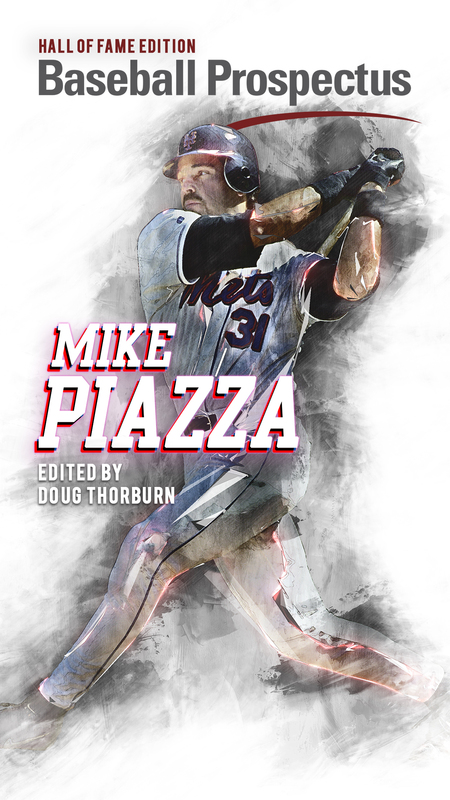 He tied for the 19th highest average exit velocity, had 230 batted balls of 95 mph+ (third most, 41st highest percentage of batted balls), tied for the 20th highest rate of Barrels per batted ball, and on and on. Porcello’s problems with the home run stood out; he allowed 38 (i.e, more than one per start). That is simply bad. 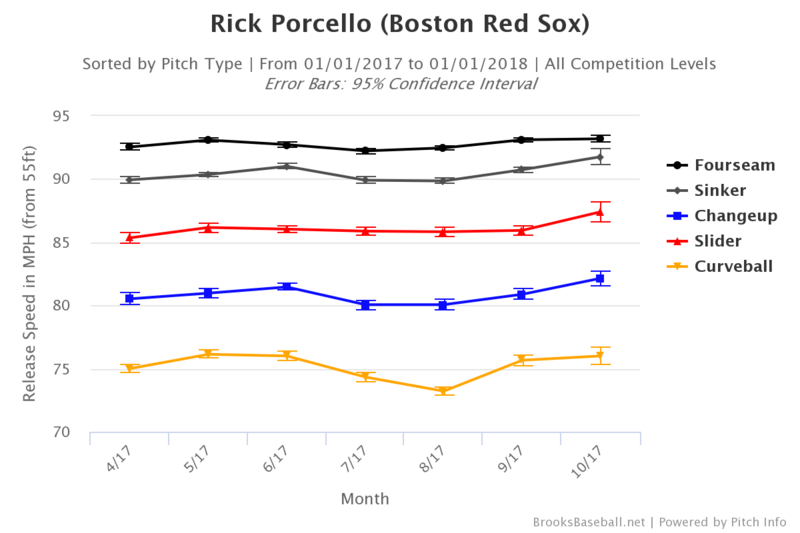 Of course, we must point out that the ball was juicier in 2017 relative to previous seasons, and that might explain some of Porcello’s issues with home runs and hard contact last season, but it wasn’t just juiced for Porcello’s outings. Even if for some reason you ignore the 38 home runs he allowed from those Statcast measures, there remain 194 missiles to explain (for those checking my math: two of the homers he allowed had an EV below 95 mph; this one and the one below) . Simply put, he got hit hard last season, and harder than most. One other noteworthy part of Porcello’s 2017 is his penchant for bad starts to his starts. He had a 7.09 RA9 in the first inning, which was more than two runs worse than his average performance in each of the next five innings, and almost a half run worse than his seventh innings. By rule, he is forced to face the top of the opponents’ order in the first inning, which usually involves stronger hitters, and this is not necessarily true for any other inning. This could explain poorer performance in the first inning, but the magnitude of Porcello’s trouble is alarming. His troubles actually lasted through his first trip through the order resulting in a reversed times through the order penalty last year, rendering the effect’s name temporarily incorrect. He was better his second time through the order and held that level the third time through. This is odd. Perhaps he needs to adjust his pre-game routine so as to be in a stronger position come first pitch. Alternatively, he should leave his routine alone, as this is most likely just a single-season oddity. It is certainly worth watching for in 2018. Despite a mostly difficult 2017, Porcello’s spot in the rotation is not in doubt. He slots into the 4/5 hole behind Sale, Price, and Pomeranz. Expecting him to recreate his 2016 season is foolish, but he is better than what he showed in 2017. I think a reasonable baseline expectation is roughly 175 innings of average run prevention. If things bounce his way a few more times than they don’t – which of course depends on him limiting hard contact more than he did this past year – he could get in the 3-4 WARP range. His doing that would push the Red Sox’s rotation to the next level. I’d like to see the Sox sign Tyler Chatwood for something fair like 4/$48MM. In order to do this, trade Porcello to a team that needs an innings-eater (Cub, Tigers, Pirates, etc) and pay down $8MM/yr of his remaining two years, which covers Chatwood’s first two years while reaping what comes in return, likely a team’s top 20 prospect and a 50 plus two lottery tickets. The rotation is Price, Sale, Pomeranz, Hector Velasquez, and Chatwood until E-Rod returns. If he pitches well, he goes to a NL contender at the trade deadline for more prospects. Rotation depth in 2018 is Brian Johnson (as possibly a swing man out of the bullpen), Jalen Beeks, Travis Lakins, and maybe Roenis Elias. Alas, Henry must go. I’ve read that his pitching stats and performances outside of Colorado are quite good. I mention him because he is expected to be available for something less than the usual pitcher salary, and he might be an effective innings eater—like CY winner Porcello was. But no relation!